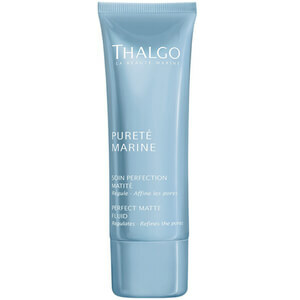 Achieve a smooth, flawless complexion with Thalgo's Perfect Matte Fluid; a skin-refining formula that works to minimise the appearance of visible pores. Harnessing the powers of Fucus Spiralis Seaweed and Tetraselmis Chui Algae, the innovative treatment helps to regulate sebum production and banish unwanted shine, whilst delivering a light, fresh scent that appeals to both men and women. Expect a clarified, refined complexion with a long-lasting matte finish. Aqua (Water), Alcohol Denat., Dicaprylyl Carbonate, Methyl Methacrylate Crosspolymer, Dimethicone, Glycerin, Cucurbita Pepo (Pumpkin) Seed Extract, Pentaerythrityl Distearate, Pentylene Glycol, Hydroxyethyl Acrylate/Sodium Acryloyldimethyl Taurate Copolymer, Sodium Polyacrylate, Phenoxyethanol, Squalane, Parfum (Fragrance), Chlorphenesin, Dimethicone Crosspolymer, Cyclopentasiloxane, Potassium Cetyl Phosphate, Algae Extract, Trideceth-6, Maris Aqua (Sea Water), Polysorbate 60, Lens Esculenta (Lentil) Fruit Extract, Glycine Soja (Soybean) Oil, Tocopherol, Ethylhexylglycerin, Sodium Phytate, Sorbitan Isostearate, PEG/PPG-18/18 Dimethicone, Sorbitol, Lecithin, Zinc Gluconate, Xanthan Gum, Caprylyl Glycol, Tocopherol, Alcohol, Glyceryl Caprylate, Phenylpropanol, Oleic Acid, Zinc Chloride, CI 77491 (Iron Oxides), CI 42090 (Blue 1).